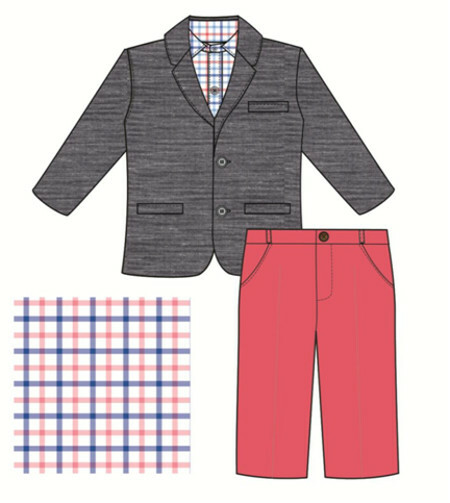 It's fresh, it's new, it's current and he'll be ever so handsome in this Good Lad three piece cool 100% cotton spring/summer suit! The chambray colored blazer is 2-button with welt pockets. It is fully lined with finished accent material that matches the button down long-sleeve shirt. The long-sleeve button-down shirt is checked with the colors of soft red, white, and royal blue. The jeans style pants are flat front with an elastic back and match the soft red color of the shirt. This suit is very versatile and can be worn as a complete outfit or mixed and matched with other wardrobe pieces. A great suit for when you want your little man to stand out and look his very best, whether it's for photos, weddings, parties or just looking dapper. All pieces are 100% breathable cotton. Machine wash cold. Import. Runs true to size.